People frequently call and ask questions about our 3-day flight attendant training. This week’s blog post attempts to answer some of those commonly asked questions. If you are looking for information more specifically about what flight attendants do, job duties, etc. please read the Flight Attendant Career Facts on the flight attendant training section of our website. How can someone become a flight attendant in 3-days? Once you get hired by an airline, you’ll be put through a very rigorous training program that will last several weeks. At the end, you will need to pass an FAA assessment and then be considered officially working as a flight attendant. Our training course prepares you to GET hired. We know that you will go through airline specific training so we don’t waste your time and money teaching you all the same things you’ll learn once you are invited to train with an airline. We focus on giving you enough of an overview to the industry and the position so that you’ll feel confident to be successful in your interview as well as have an advantage over other candidates with no prior training or aviation experience. We also help you with job prep such as resume writing, mock interviewing, dress for success, and professional networking so the training we provide is invaluable if your goal is to get the job. What is your job placement rate? We do not have this information available due to the fact that not all of our students keep in touch with us after completing the training. Some students get hired right away while others take longer because they may not be available to start right away, may have a life situation that doesn’t allow them the flexibility to relocate or meet the job requirements at the time, or sometimes it may be because the airline requires them to be 21 and they take the course before they are old enough to apply. But we do have a very high interview rate. Our partner airlines give preference to students who complete our training so most of our graduating students will have an interview scheduled shortly after finishing the program! What will I learn in this training? Topics covered in AeroStar’s flight attendant training program include: FAA regulations, flight attendant duties and responsibilities, airline policy and procedures, duty and rest requirements, land and water evacuations, emergency procedures, fire fighting, turbulence, aviation physiology, aircraft familiarization, aircraft cabin components, crew resource management, first aid, security, and aircraft interior systems, just to name a few. We will also cover job searching, resume and cover letter writing, how to interview well, dressing for success and professional networking. What kind of certificate will I get at the end? We present you with a certificate of completion at the end of the program and have a little graduation ceremony for our students as well. The certificate has our company seal, logo, your name, date and is signed by the instructor so you can have a record of completing the training. We recommend you include this on your resume or in your job portfolio so you can refer to it when attending job interviews. You can also make a digital copy that you can include when sending in job applications. How will you help me find a job afterwards? Aside from partnering with various regional airlines who readily look to hire our students, we also have a closed Facebook alumni group that only our students can join. You will receive an invitation once you complete the training and we regularly post flight attendant jobs and companies who are hiring in here along with other valuable training and career tips relevant to the aviation industry. This is also a great way to network and keep in touch with the peers from your class and your instructor and enrollment coordinator, who can also be on the lookout for positions you might be a good fit for. Where does the training take place? The flight attendant training takes place in a large classroom at our headquarters office in Kissimmee, Florida. We are located at the Kissimmee Gateway Airport at 3954 Merlin Drive, Kissimmee, FL 34741. If we have a pilot training class occurring at the same time as the flight attendant training, we may meet in a conference room at the FBO next door, but we will let you know where to report on the first morning that you arrive. Coffee is provided throughout the training, other beverages and snacks may be purchased for a small fee. Where will I stay during the training? It’s really up to you where you stay during the training, however we do partner with some local hotels that offer us corporate rates so we can gladly help you make accommodations while you are here, or you are free to shop around and find the best deal. We are located right off of US 192, about 25 minutes from the Orlando International Airport and about 10 miles from Disney World so there are plenty of lodging options nearby. We recommend you bring a car or rental car so you can get around more easily, or if you prefer to take a cab or Uber, there are lots of restaurants and entertainment options close by as well. What airlines do you partner with? We don’t give this information out prior to the class for proprietary purposes but they are regional airlines, which is where most flight attendants start out at in entry-level roles before moving on to the major airlines after a couple of years. What are the requirements to participate in the training? You must be at least 18 years of age and hold a high school diploma and a valid passport. We require you to bring a copy of your driver’s license and passport on the first day of class for our records. International students are welcome but you’ll need a B1/B2 visitor’s visa in order to attend and we do not offer any type of sponsorship or financial assistance for our flight attendant program. How often do you have this flight attendant training course? We typically hold the flight attendant class every other month or so pending enrollment requirements. If we need to cancel a class due to low enrollment numbers, we can either issue a refund or move you into our next available class date. We close our enrollment window two weeks prior to the training start date so that if we do need to make any adjustments, we can give you plenty of notice. How do I get my training/study materials? You will receive your training packet on the first day of class. We strongly recommend you bring both a printed and digital copy of your existing resume to class so we can give you some pointers and assist in tailoring it to the aviation industry. If you do not currently have a resume, look for a template we’ll send out via email with a sample flight attendant resume and cover letter you can use to get you started. How do I enroll for this training? There is an online application form you can fill out with all the information needed to enroll. Once you submit this online form, check your email for a confirmation email from us with the next steps for making your deposit and completing your enrollment. We can take credit card over the phone and email you a receipt. Once enrolled, you will receive a few more emails from us leading up to the training and then you may receive a post-training survey email from us afterwards. 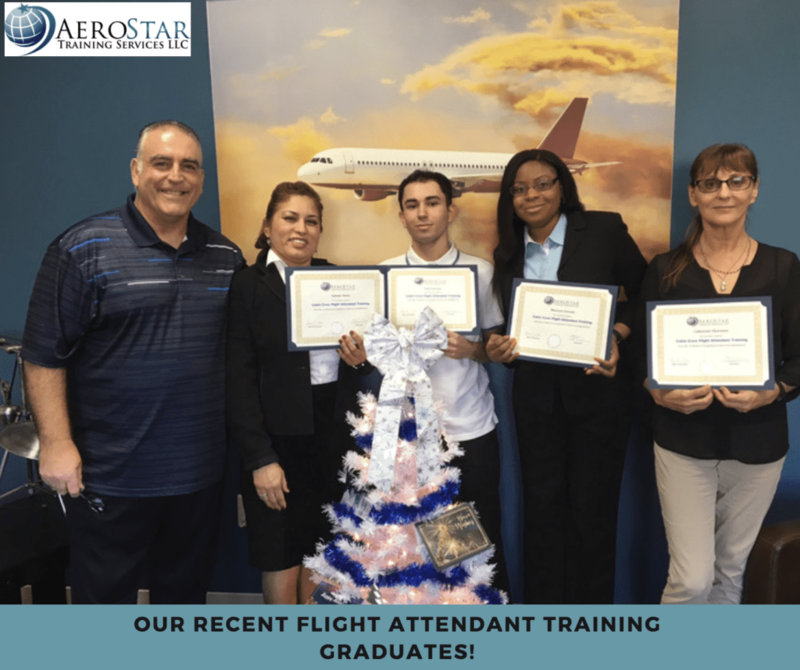 Last week AeroStar graduated a class of flight attendant training students. These students received certificates after successfully completing a 3-day training held at the Kissimmee Gateway Airport. The students trained in areas ranging from FAA regulations, aircraft terminology, phonetic alphabet, military time, airport codes, weather & turbulence, flight attendant duties and announcements, safety briefing, emergency equipment and evacuation drills, to name a few. Do you ever wonder what it would be like to wake up in Los Angeles and go to bed in Paris? Or how about seeing New York from above at sunrise and the Grand Canyon at sunset? Flight attendants don’t just wonder about things like these- they live them! Flight attendants or “Cabin Crew Members” represent one of the largest job categories in the air travel industry. In the United States alone, the airlines employ approximately 115,000 flight attendants and hire over 10,000 more each year to replace the aging workforce. In 2014, cabin crew members in the U.S earned $38.00 per hour an average. Due to the glamourous nature of the position and the many benefits, the airlines receive thousands of applications each day. With all the competition, the odds of being selected for an interview are very low. Less than two percent of applicants are selected to interview. However, if your dream is to be a flight attendant there are ways to highly improve your chances of landing that coveted position. First, it’s important to understand the airline hiring process and the high cost associated with it. Cabin crew training is an expensive and timely process. Resumes are selected based on very specific key words, training and work experience. The interview process can be very challenging not to mention stressful. Once hired, the applicant is selected as a candidate for cabin crew training. Due to the knowledge required and the physical demands, less than a third of candidates will make it through the cabin crew training process and become an employee. The airlines lose money when a candidate doesn’t pass their training. So to be cost effective, the airlines prefer to hire directly from a cabin crew training program. At AeroStar Training Services, the students have already displayed their ability to perform in the demanding cabin crew environment. While in classes at AeroStar, classes are taught by experienced flight attendants in an approved cabin crew training facility by experts who know exactly what the airlines are looking for. The program has been hugely successful in helping people land their dream job as a flight attendant & managed to significantly lower the airlines cost by providing applicants who have proven their abilities to perform in a cabin crew position. The cabin crew training classes at AeroStar are very popular and fill up fast, so contact Aerostar’s Flight Attendant Enrollment Specialist Devin Messer to secure your spot in the next cabin crew class and launch your career as a flight attendant and start living your dream!